To determine the feasibility of using high-resolution volumetric zero echo time (ZTE) sequence in routine lung magnetic resonance imaging (MRI) and compare free breathing 3D ultrashort echo time (UTE) and ZTE lung MRI in terms of image quality and small-nodule detection. Our Institutional Review Board approved this study. Twenty patients underwent both UTE and ZTE sequences during routine lung MR. UTE and ZTE images were compared in terms of subjective image quality and detection of lung parenchymal signal, intrapulmonary structures, and sub-centimeter nodules. Differences between the two sequences were compared through statistical analysis. Lung parenchyma showed significantly (p < 0.05) higher signal-to-noise ratio (SNR) in ZTE than in UTE. The SNR and contrast-to-noise ratio (CNR) of peripheral bronchus and small pulmonary arteries were significantly (all p < 0.05) higher in ZTE. 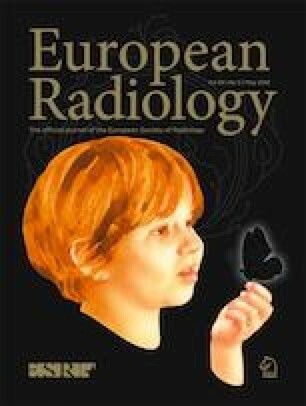 Subjective image quality evaluated by two independent radiologists in terms of depicting normal structures and overall acceptability was superior in ZTE (p < 0.05). The diagnostic accuracy for sub-centimeter nodules was significantly higher for ZTE (reader 1: AUC, 0.972; p = 0.044; reader 2: AUC, 0.946; p = 0.045) than that for UTE (reader 1: AUC, 0.885; reader 2: AUC, 0.855). Mean scan time was 131 s (125–141 s) in ZTE and 467 s (453–508 s) in UTE. ZTE images were obtained with less acoustic noise. Implementing ZTE as an additional sequence in routine lung MR is feasible. ZTE can provide high-resolution pulmonary structural information with better SNR and CNR using shorter time than UTE. • Both UTE and ZTE techniques use very short TEs to capture signals from very short T2/T2* tissues. • ZTE is superior in capturing lung parenchymal signal than UTE. • ZTE provides high-resolution structural information with better SNR and CNR for normal intrapulmonary structures and small nodules using shorter scan time than UTE. The online version of this article ( https://doi.org/10.1007/s00330-018-5889-x) contains supplementary material, which is available to authorized users. The scientific guarantor of this publication is Kyung Nyeo Jeon. The authors of this manuscript declare a relationship with GE Healthcare. GE Healthcare had provided them with 3D cones ultra-short TE research pulse. MJ Hwang and JS Lee are employees of GE Healthcare (GE Healthcare Research, Korea). GE Healthcare had no role in the design and performance of the study, data analyses, or data interpretation.